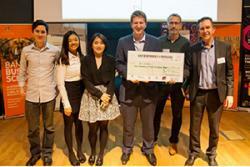 Left to right are winning team members: Adam Reading, Yui Ting Lee, Fangzhi Cao and Jesse Young with their winning cheque presented by David Stacey of Zip World, with Prof Oliver Turnbull With Wales declared ‘the Year of Legends’ in 2017 by Visit Wales, businesses have new opportunities to showcase the best that North Wales has to offer and promote the region as a destination. Tapping into this concept, Zip World have joined together with eight other leading North Wales adventure businesses to form a marketing group, the Adventure Map, to encourage visitors to Wales to spend more, stay longer and enjoy a greater range of activities. Bangor University’s Enterprise by Design team are delighted to have this pioneering company as the commercial partner this year to provide the students with a meaningful challenge that actively seeks to contribute to the future success of the company. With its long association with outdoor adventure, North Wales is now being recognised on the international stage, with Lonely Planet naming it one of the top ten places to visit in the world for 2017 in their annual Best in Travel list. Zip World is a key driver of this change and an attractor to the region with a range of adventure sites in three locations locally, boasting the world’s fastest zip line, the first four-person zip line and a unique network of huge underground trampolines in disused slate caverns. In keeping with the Zip World vision of constantly innovating around the core activities and developing new and unique offers to clients, the brief created for Enterprise by Design 2017 proposed a product concept for Zip World’s sites that would deliver an improved experience for their diverse customer base. Participating students identified problems and explored solutions relating to a range of target groups of Zip World clients. Twelve multidisciplinary teams pitched for a stake in the £5,000 prize fund following ten weeks of working alongside postgraduate facilitators and academic specialists in a design-led process to tackle this real world design brief. David Stacey, Managing Director of Zip World, UK, presented the winning prize of £2,500 to Team Bluebell (comprising Electronic Engineering student, Adam Reading, Fangzhi Cao from the School of Business, Jesse Young from the School of Creative Studies & Media and Yui Ting Lee, from Psychology), for their ‘Slate VR’ concept; a package of VR related benefits to enhance the customer experience at Zip World sites. ‘There were several ideas with real potential’ said David, ‘the final choice was influenced by the credibility of the presenters, the superb content and professional delivery. We want to work with credible people who fit our culture and brand and this team did that brilliantly. We also wanted an innovative solution that challenged the norm and at the same time delivered commercially across a multi-site operation. We felt this group was extremely professional, understood our brand and delivered significant potential for future value’. In addition to the monetary award the winning team was offered the opportunity to capitalise on their success with an offer of paid employment in the marketing and operations teams of Zip World. The second prize of £1,500 went to Team Buttercup; Benjamin Simmonds, Ryan Cornwell, Robert Griffiths and Emily Burns, and Third prize of £500 to Team Poppy; Noor Hani, Adam Haigh, Tim Hunt and Lydia Rose. Professor Oliver Turnbull, Pro Vice-Chancellor for Teaching and Learning at Bangor University who was on the judging panel said of Enterprise by Design: ‘This is one of the most innovative and inspirational programmes that I've seen in higher education, and I'm delighted that it was developed in Bangor University’. On the judging panel alongside David Stacey and Professor Turnbull were Nick McCavish, Head of Operations at Zip World, Phil Nelson, Adventure Tourism Consultant and Phil Scott from RibRide. A central activity for Arloesi Pontio Innovation, Enterprise by Design provides a way to teach students about enterprise while bringing together academics from various disciplines to work on commercial collaborative projects. Academic specialists who contributed were Dr Iestyn Pierce, from Computer Science and Electronic Engineering, Dr Gareth Harvey from Psychology, Dr Siwan Mitchelmore from the Business School, Dr Steffan Thomas from the School of Creative Studies & Media, Dewi Rowlands from Product Design, School of Education and Dr Andy Goodman, Director of Arloesi Pontio Innovation. Lowri Owen and Ceri Jones from B-Enterprising in the Careers and Employability Service provided overall coordination of the course. Postgraduate facilitators were Conor John, Nikita Savy, Katherine Atkinson, Rory Farmer, Charlotte Wells, Marcela Banguero, Bukola Adetonwa, Ankita Goyal, Vasianna Antiochou, Thomas Nichols, Andy Leavers, Ilan Davies plus Uber facilitators Rhi Wilmott and Kate Isherwood. Pontio Innovation staff provided support to the whole team.